I make it a point to read a Norwegian book or two every year (and it has to be a book by a Norwegian author, not any book translated into Norwegian, except maybe a Danish or Swedish book). It helps me maintain the language. I speak, read, and write Norwegian fluently, but over time words escape me. Reading a book in Norwegian brings back lost words and adds new ones. Reading a Norwegian book during spring is always good timing in preparation for our upcoming annual trip to Norway. 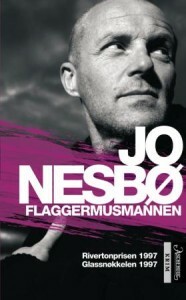 This spring, I read Jo Nesbø’s Flaggermusmannen (The Bat), the first in the popular Harry Hole detective series. A fellow Norwegian here in LA had spoken highly about the series, and I had read an article about tours given in Oslo featuring Harry Hole locales. I was intrigued. I easily found a digital version in Norwegian at a Norwegian online bookstore. Yeah for modern technology! But I had to pay more than twice as much as I would have had to pay for a digital Harry Hole book in English, $18 vs $8. Boo expensive Norway! Since reading it in Norwegian was important to me, I splurged. Initially, I was a little disappointed. I admit, I hadn’t read what the book was about before buying it. I had expected the story to take place in Oslo. Instead the detective had been sent to Sydney, Australia to help with the investigation of a Norwegian girl’s murder. Once I got over that, I did enjoy getting a glimpse of life in Sydney and learning a bit about Australian culture. Harry Hole, the main character, wasn’t my ideal type of character. He started off alright, but when he started seeing a woman whom he met through the investigation and who was a friend of the victim, I began to question his judgment, which I continued to do as I learned more about his past and followed him throughout the investigation. The plot took some unexpected twists before the murder was solved. I liked how it kept you wondering how the investigation was going to be resolved, and isn’t that what a good crime story does? Many interesting characters were involved in one way or another. At times, it was a little hard to keep track of what was going on. I may have been reading too fast for my own good or reading too late at night so I won’t blame the author for that. I’ll just recommend that readers pay attention to details and characters. The book was enjoyable enough to finish and it served its purpose of refreshing my language skills. 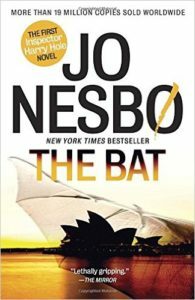 I’m not going to rush out and buy the next Harry Hole book in the series, but I will give the series another try. I’m hoping the next one takes place in Oslo. I don’t read Norwegian books just to brush up on the language. I also like to get absorbed in a Norwegian setting and experience its culture vicariously. I missed that in this reading experience. I would *love* suggestions on what Norwegian book to read next… My criteria are that they are written by a Norwegian (or perhaps Swedish or Danish) author, are in bokmål Norwegian, and ideally take place in Norway. Please leave any suggestions in a comment below! Thanks! You can support what I do on this website by purchasing the book at Amazon (or any other book or item for that matter). AVikingInLA is a participant in the Amazon Services LLC Associates Program, an affiliate advertising program designed to provide a means for sites to earn advertising fees by advertising and linking to amazon.com. At no extra cost to you, you support my work. Thank you. This entry was posted in Books & Reading and tagged #booksintranslation, crime fiction, Jo Nesbø, Nordic Noir by Patricia Zanuck. Bookmark the permalink. Jeg håper du får noen gode tilbakemeldinger med hensyn til neste norske bok…..jeg kandessverre ikke hjelpe deg her…..
På Facebook har jeg blitt anbefalt Anne Holt og Knausgård. Bra start!